Paradise Lake:There is a bit of cross-country involved in this hike, but the main trailhead is easy to find, and if you are a bit adventurous you can make a nice 2-3 day trip exploring this area just to the North of I-80. It's a total of 6-7 miles to the lake from the trailhead. Loch Leven Lakes: There are three Loch Leven Lakes (and since "loch" means lake, there's an extra lake in the name, too!) 3.5 miles of pretty much uphill climbing takes you right out of the I-80 pass and over the ridge to these three lovely lakes. There's a odd stretch where you cross the railway tracks, but there are fish in the lakes and some nice views to the west as well. This one is also possible as a snow camping trip in the winter--or as a day hike if you don't have time to stay. Five Lakes Basin: Straight out of Squaw Valley, this trail gets a ton of traffic, but we spent a lovely day hiking up to these lakes, catching a few trout, eating lunch, and heading back home again. An easy four-mile hike with about 1000 feet of elevation gain means there are lots of people--but there are also five lakes to hide in. Also very possible as a day hike as it's only about 3 miles to the first lake. Grouse Ridge: Off Highway 20 just west of where it meets I-80, this is a great trailhead with a ton of lakes as potential destinations. And the best part of this hike is that the first two miles is downhill. The only real uphill is on the way back out, when your packs are much lighter! From the Grouse Ridge campground and fire lookout, you can select which lake you’d like to visit. Then hike down to the lakes, keeping your eye out for good campsites. This can be as short as a two or three-mile hike for an overnight, or you can visit a few lakes over the course of a few days. Glacier Lake, at the eastern end, is lovely, but there are plenty more to choose from. And fishing is quite good in this area, for rainbows and browns. Mt Judah:This trail leads straight out of the Sugar Bowl Ski Area parking lot, and in about 4 miles takes you up to the top of Mt. Judah, overlooking Donner Lake and the Crystal Range to the south. Mt. Judah is about 8200 feet, and you can continue on this hike to bag a couple more peaks, if that is what gets you excited. Castle Peak: Our favorite day hike in this area takes you to a grand view overlooking Donner Pass and the whole northern Tahoe region. The trail is pretty straightforward--you head northwest from the trailhead to the top of the ridge, then turn northeast to climb up the ridge up to the peak. The last little bit requires some scrambling, but only if you insist upon standing on the very top. We did, and it seemed worth it. Andesite Peak: this is the smaller peak just southwest from Castle Peak--and you climb it by ascending to the same ridge, then heading southeast (head left) to the top of Andesite Peak. We did it in May, when it was too snowy to get to Castle Peak, and had a great time. 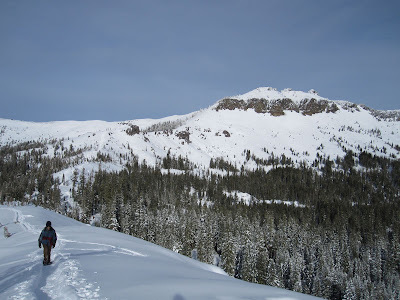 The photo at the top of this page is Castle Peak from Andesite Peak, in winter.